President Rodrigo Duterte’s plan to change the name of Philippines to the “Republic of Maharlika” is actually based on the late dictator Ferdinand Marcos’ “fictitious” guerrilla unit which he used to fake his war records. Duterte said that Marcos was right all along on his supposed plan to change the name of the country from the Republic of the Philippines to Republic of Maharlika. “Actually, tama si Marcos. Panahon ni Marcos, tama talaga si Marcos. Gusto niya palitan [ng] Maharlika, the Republic of Maharlika because maharlika is a Malay word and it means more of a concept of serenity and peace,” he said in a speech at the municipality of Buluan in Maguindanao. It was not Marcos, however, who proposed the name change but former Senator Eddie Ilarde in 1978. This was heavily criticized that time due to its association to the “fictitious” guerilla unit called “Ang Mga Maharlika” which Marcos claimed to be the leader of. He claimed that they fought off Japanese forces from 1942 to 1944. “Army investigators finally concluded that Maharlika was a fictitious creation and that ‘no such unit ever existed’ as a guerrilla organization during the war,” the report said. Moreover, in 1950, the US Veterans’ Administration and the Philippine Army found that several members of this fictitious group were the ones who have committed “atrocities” against Filipino civilians and have engaged in “nefarious” activities. The report said that since the Marcos presidency in 1965, he gave the name Maharlika to the following: a hall in the presidential palace, the government-owned broadcast network and the present Pan-Philippine Highway, which is the longest highway in the country. 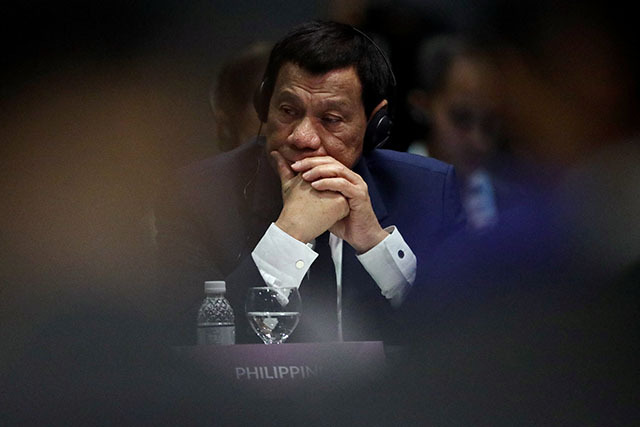 Aside from showing his support to the former strongman, Duterte also reasoned that the name “Maharlika,” which means nobility in Filipino, would be better fit the Filipinos’ Malay identity. Historians considered Filipinos to have Malay origins. “The Philippines was discovered by Magellan using the money of King Philip… Okay na iyan. Balang araw palitan natin,” the chief executive said. The Philippines was named after Spain’s King Philip II in the 16th Century. It was given by Spanish explorer Ruy Lopez de Villalobos. Some Filipinos weighed in on Duterte’s proposition on social media. actually referred to pre-colonial Tagalog society's feudal warrior class; Marcos ~incorrectly~ claimed that it referred to nobility as part of his fascist propaganda—and Duterte, like Marcos, also wanted to change the name of the Philippines to "Maharlika." In 1978, Ilarde filed Parliamentary Bill 195 to change the name of the Philippines to Maharlika referring the country’s ancient heritage before the Spanish era. Ilarde also explained that King Philip II, after whom the Philippines was named, is not a noble ruler, rather, he was cruel to his family and to the Kingdom of Spain. However, being closely associated to Marcos, the proposal failed to push through. In 2017, this move was brought up again by senatorial aspirant Gary Alejano. He filed House Bill 5867 that seeks to create a Geographic Renaming Commission that will look into the possibility of renaming the Philippines. Aside from Maharlika, there were other suggested names to replace the Philippines, such as Rizalines after Jose Rizal, Luzvimin or the combined first syllables of the three major regions and Solimania after Raja Soliman.